What you are experiencing is a reaction to a zeitgeber. it’s the same thing that causes the pets to start circling like sharks just before dinner time and it’s what makes the morning glories open in the morning and not whenever-they-get-around-to-it o’clock. Another zeitgeber notifies the smarter insects to tuck in before dusk because, eek–bats will eat everything! The clock in your body has learned to alert you to look at the clock on the wall at the same time of day, probably because you freak out every time it happens and the chemicals that surge in your brain think they are doing you a favor. This is the same thing that happens when you wake up just before your alarm clock activates. 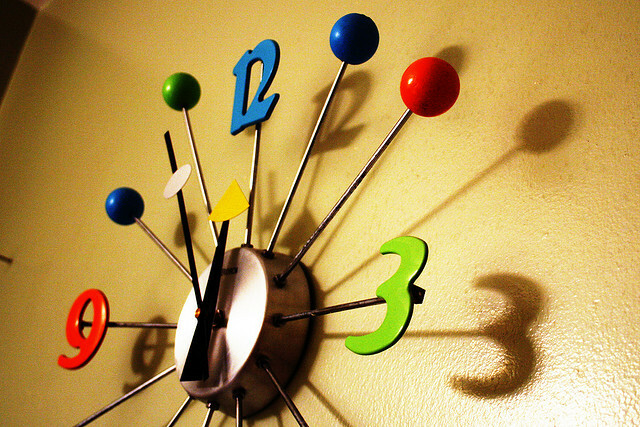 Your brain is trying to avoid the shock of the clock. We are able to time all sorts of things with our internal clock, or circadian rhythms, but it’s limited to our person so we still need clocks to synchronize with everyone else. Can you imagine how slowly people collaborate when there are no agreed-upon times? I’ll meet you at the well during the full moon to discuss it. That’s only 20 days away. When you get to a part of your life where each day is very similar to the next, try to remember that it’s not a curse, but a curse-like blessing. It’s a chance for you to do better and master the things you need to master. Don’t fight the monotony–use it. Just because your days might be predictable, they don’t have to be boring. You can fill them with novelty and create your own interesting details. Or you can watch new things on teevee and let that be the difference. I wonder about the push to have high school days more like college with alternating schedules. Maybe it would be better for teens to learn on the same daily schedule. The alternating days seem to worry everyone, at least at first. Doesn’t it feel like it doubles the time you need to get your bearings at a new school? Try not to worry about that haunted clock feeling, though. You could be that stoner who looks at the clock every day and makes the exact same 4:20 joke every time. It could be worse. Previous PostPrevious Why don’t you have a “donate” button? Next PostNext Why do people search [for] answers in religion?